OMERO.web is a framework for building web applications for OMERO. It uses Django to generate HTML and JSON from data retrieved from the OMERO server. 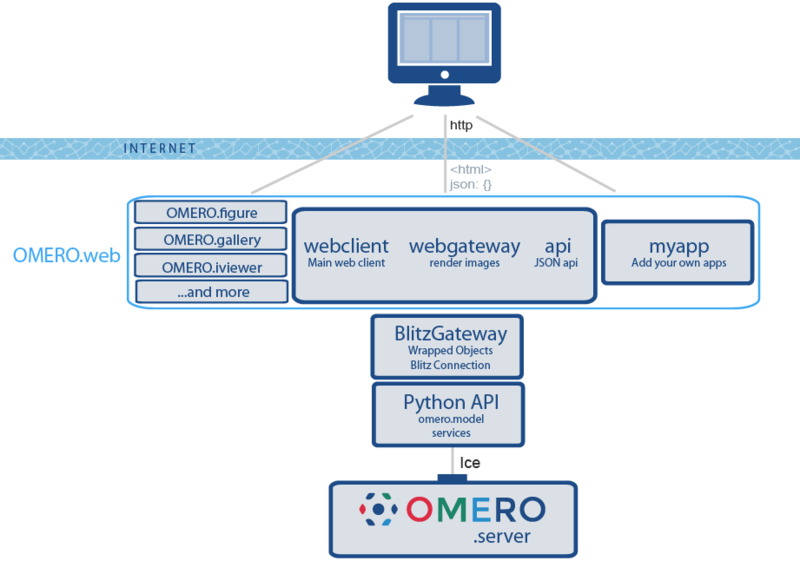 OMERO.web acts as a Python client of the OMERO server using the OMERO API, as well as being a web server itself (see ‘infrastructure’ info below). It uses Django ‘apps’ to provide modular web tools, such as the webclient, webgateway and the JSON api app. This modular framework makes it possible to extend OMERO.web with your own apps. The OMERO.web framework is all based on the OMERO Python API. Code-generated omero.model objects communicate remotely with their counterparts on the OMERO.server using Ice from ZeroC. The Blitz Gateway wraps omero.model objects to facilitate many loading and update operations (see Blitz Gateway documentation). The OMERO.web framework consists of several Django apps that are included in the OMERO.server release, as well as others that can be installed independently (see below). It also includes utilities for creating and retrieving connections to OMERO (see example below and Writing OMERO.web views for more details). webclient: Main web client for browsing, viewing and annotating images. More information available under OMERO.web. webgateway: Provides rendered images and JSON data for other OMERO.web apps or for external applications hosted elsewhere. See WebGateway. webadmin: Tool for OMERO.server Administrators to manage users and groups. api: New in 5.3.0, this provides a JSON API for OMERO. See JSON API. omero-figure: The OMERO.figure app allows you to create scientific figures. omero-webtest: webtest is an example app that contains several code samples mentioned in the following pages. omero-iviewer: The OMERO.iviewer is a new (currently unreleased) image viewer that supports ROI creation and editing. webtagging: The webtagging app was developed externally by Douglas Russell. It supports ‘auto’ tagging based on image name and Tag-based filtering of data. omero-mapr: The OMERO.mapr app is a new tool that allows browsing data through Map Annotations linked to images. omero-gallery: OMERO.gallery provides a simple interface for browsing Projects, Datasets and Images. Although it is possible to access functionality from any installed app, ONLY webgateway and api should be considered as a stable public API. URLs and methods within other web apps are purely designed to provide internal functionality for the app itself and may change in minor releases without warning. The preferred workflow for extending OMERO.web is to create a new Django app. Django apps provide a nice way for you to keep all your code in one place and make it much easier to port your app to new OMERO releases or share it with other users. To get started, see Creating an app. Further documentation on editing the core OMERO.web code is at Editing OMERO.web. If you want to have a quick look at some example code, see below. This tiny example gives you a feel for how the OMERO.web framework gets data from OMERO and displays it on a web page. You can find this and other examples in the OMERO.webtest repository. There are 3 parts to each page: url, view and template. 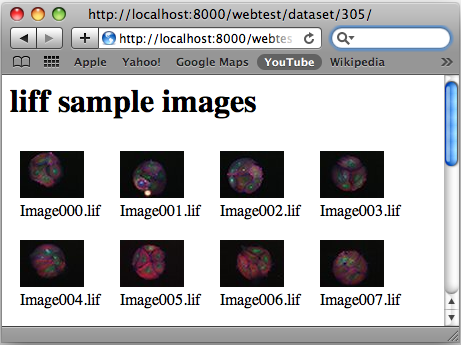 For example, this code below is for generating an HTML page of a Dataset (see screen-shot). If you have OMERO.web running and webtest installed, you can view the page under http:// <servername>/webtest/dataset/ <datasetId> . url goes in omeroweb/omero_webtest/urls.py This maps the URL ‘webtest/dataset/<datasetId>/’ to the View function ‘dataset’, passing it the datasetId. view function, in omeroweb/omero_webtest/views.py. N.B. : @login_required decorator retrieves connection to OMERO as ‘conn’ passed in args to method. See Writing OMERO.web views for more details. Next: Get started by OMERO.web installation for developers….